Aqua One Betta Divided Glass Tank 20cm20 W x 20 D x 20cm HVolume: 8 LitresThe Aqua One Betta Divided Glass Tank allows you to keep two Betta fish in the one tank. Creating a visual illusion that two Betta’s are swimming together.Features & Benefits:Ideal tank for office desktopsGreat for beginners!Compact sizeModern, simple design360° view of your Betta fishSuitable for: Betta..
Aqua One Betta Divided Glass Tank 25cm25 W x 20 D x 20cm HVolume: 10 LitresThe Aqua One Betta Divided Glass Tank allows you to keep two Betta fish in the one tank. Creating a visual illusion that two Betta’s are swimming together.Features & Benefits:Ideal tank for office desktopsGreat for beginners!Compact sizeModern, simple design360° view of your Betta fishSuitable for: Betta..
Aqua One Betta Duo Cube Glass With Lid24 x 12 x 20cm5 Litre Volume..
Aqua One Betta Sanctuary Glass Aquarium 10L BlackThe Aqua One Betta Sanctuary provides everything you need to create the ideal environment for a Betta fish. The Betta Sanctuary includes energy efficient lighting with white and blue LEDS to create a stunning daylight and moonlight display.The easy to use compact filter will help to maintain water quality, providing both mechanical and biological filtration. Together with the preset heater to keep the water at the right temperature, it will ensure..
Aqua One Betta Sanctuary Glass Aquarium 10L WhiteThe Aqua One Betta Sanctuary provides everything you need to create the ideal environment for a Betta fish. The Betta Sanctuary includes energy efficient lighting with white and blue LEDS to create a stunning daylight and moonlight display.The easy to use compact filter will help to maintain water quality, providing both mechanical and biological filtration. Together with the preset heater to keep the water at the right temperature, it will ensure..
Aqua One Betta Trio Cube Glass With Lid36 W x 12D x 20cm H6 Litre volume..
Aqua One BettaArc Kit with LED Base Light BlackCreate a beautiful Betta tank display with the Aqua One BettaArc! See how easy it is to keep Betta fish with this all in one kit that will look great on any desktop! The LED base light creates a luminous effect that will light up the vibrant colours of your Betta fish to create a striking effect.The BettaArc is available in a stylish curved design in Black or Silver.Features and Benefits:• Complete kit ready for fi..
Aqua One BettaArc Kit with LED Base Light SilverCreate a beautiful Betta tank display with the Aqua One BettaArc! See how easy it is to keep Betta fish with this all in one kit that will look great on any desktop! The LED base light creates a luminous effect that will light up the vibrant colours of your Betta fish to create a striking effect.The BettaArc is available in a stylish curved design in Black or Silver.Features and Benefits:• Complete kit ready for f..
Aqua One BettaBloc Stackable Betta Kit BlackAqua One BettaBloc is the easy and convenient alternative to keeping fish! Designed to house Betta fish (also known as Siamese Fighting Fish).The BettaBloc comes as a complete kit that is easy to assemble and maintain. BettaBloc tanks can be stacked to create a unique multi level look and make a great addition to any office desktop.Features and Benefits:• Complete kit ready for fish• Great for beginners• Modular design for mult..
Aqua One BettaBloc Stackable Betta Kit SilverAqua One BettaBloc is the easy and convenient alternative to keeping fish! Designed to house Betta fish (also known as Siamese Fighting Fish).The BettaBloc comes as a complete kit that is easy to assemble and maintain. BettaBloc tanks can be stacked to create a unique multi level look and make a great addition to any office desktop.Features and Benefits:• Complete kit ready for fish• Great for beginners• Modular design for mul..
Aqua One BettaStyle Acrylic Tank 3L Blue16 W x 16D x 18.5cm HThe Aqua One Betta Style is a compact and stylish aquarium kit designed especially for Betta fish. The Betta Style is available in three popular colours, with the option of an LED light to highlight the colour of your Betta. The matching lid provides easy access and helps prevent jumping.The convenient kits provide everything you need to create a stunning Betta aquarium, including a reversible backgro..
Aqua One BettaStyle Acrylic Tank 3L Blue with Light16 W x 16D x 18.5cm HThe Aqua One Betta Style is a compact and stylish aquarium kit designed especially for Betta fish. The Betta Style is available in three popular colours, with the option of an LED light to highlight the colour of your Betta. 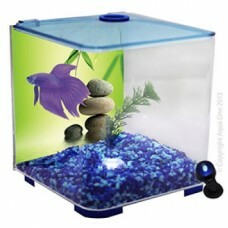 The matching lid provides easy access and helps prevent jumping.The convenient kits provide everything you need to create a stunning Betta aquarium, including a reversible&n..
Aqua One BettaStyle Acrylic Tank 3L Charcoal16 W x 16D x 18.5cm HThe Aqua One Betta Style is a compact and stylish aquarium kit designed especially for Betta fish. The Betta Style is available in three popular colours, with the option of an LED light to highlight the colour of your Betta. The matching lid provides easy access and helps prevent jumping.The convenient kits provide everything you need to create a stunning Betta aquarium, including a reversible bac..
Aqua One BettaStyle Acrylic Tank 3L Charcoal with Light16 W x 16D x 18.5cm HThe Aqua One Betta Style is a compact and stylish aquarium kit designed especially for Betta fish. The Betta Style is available in three popular colours, with the option of an LED light to highlight the colour of your Betta. The matching lid provides easy access and helps prevent jumping.The convenient kits provide everything you need to create a stunning Betta aquarium, including a reversib..
Aqua One BettaStyle Acrylic Tank 3L Pink16 W x 16D x 18.5cm HThe Aqua One Betta Style is a compact and stylish aquarium kit designed especially for Betta fish. The Betta Style is available in three popular colours, with the option of an LED light to highlight the colour of your Betta. The matching lid provides easy access and helps prevent jumping.The convenient kits provide everything you need to create a stunning Betta aquarium, including a reversible backgro..